Preliminary discipline and weapon training of all Aircraft Maintenance ratings except Air Apprentices. The establishment comprised of 5 separate camps: Camp 1 (HQ), New Road, Croft, Camp 2 at Risley 1½ miles E., Camp 3 Lady Lane, Croft ¾ mile N., Camp 4 at Lowton 4 miles N., and Camp 5 at Glazebrook 6½ miles E.. Living quarters at Camp 3, Lady Lane, Croft ¾ miles (R) N. of HQ. Opened in July 1942 at Risley, Warrington in Cheshire, Royal Naval Air Training Establishment HMS Gosling was to be the Fleet Air Arm training depot for Air Fitters, Air Mechanics and Radio Mechanics. HMS GOSLING also trained r Royal Marines of the Royal Naval Air Station Defence Force. HMS GOSLING was such a large establishment it comprised of 5 separate, dispersed, sites; the Headquarters and administrative centre was Camp 1, New Road, Croft. The other four sites were training camps - Camp 2 at Risley, Camp 3 Lady Lane, Croft, Camp 4 at Lowton, and Camp 5 at Glazebrook. (as known as Cadishead) The establishment was collectively named as R.N. Aircraft Training Establishment Risley. 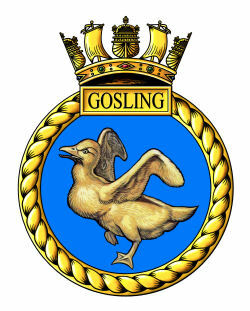 Shortly after GOSLING opened a further site was acquired at Culcheth for accommodating Naval and W.R.N.S. radio mechanics for the Fleet Air Arm for the final stage of technical training, this site was to be commissioned as HMS ARIEL on October 8th 1942 with its accounts being held by GOSLING. After initial assessment at recruiting depots, new entrants arrived at Camp 1 for joining routine before being allocated to Camp 4 for 12 weeks basic training - This included a week at RAF Sealand, Flintshire, where trainees attended the rifle and grenade live firing range. Depending on the results of aptitude testing on completion of this initial training ratings were sent other GOSLING camps, or to other training establishments, for trade training. Those selected for Air Fitter training went to R.N.A.T.E. Watford, Air Mechanics Engines, & Air Mechanics Airframes to No 6 School of Technical Training at R.A.F. Hednesford, and Air Mechanics Electrical to No, 12 School of Technical Training at RAF Melksham. Air Radio Mechanics went to HMS ARIEL. The Royal Naval Air Station Defence Force training Camp at Lowton relocated to Towyn, North Wales on March 11th 1943, it is unclear as to the purpose of Camp 4 after this date. In the summer of 1944 HMS GOSLING was tasked with the conversation and outfitting of specialist radio and Radar vehicles for the Mobile Naval Airfields Organisation, these were to form part of the equipment of the Mobile Naval Air Bases which were about to begin assembling. Other conversion work was carried out by N.A.R.I.U. (Naval Air Radio Installation Unit) at R.A.F. Christchurch were containerised radio workshops were constructed and outfitted. Such vehicles were in short supply as priority for vehicles and equipment had been focused on the build-up to the Normandy landings in June. Work was slow and as a result the first MONAB to be assembled experienced problems with getting their Radio & Radar van allocation and had to sail for Australia without some key elements which had to follow by later transports. From October 1944 HMS GOSLING also provided accommodation and training in support of the Mobile Naval Airfields Organisation which had begun assembling the MONABs in September at its new base at RNAS Ludham, Norfolk. Ludham was a compromise formation base and it was soon experiencing accommodation problems; the station was not really suitable for purpose and overcrowding was becoming a serious problem. To help overcome this problem it was decided to split the formation of the second, larger, MONAB, the technical components -comprising of 600 ratings - was to assemble at HMS GOSLING (Camp 2 at Risley?). Principal activities untaken whilst at Risley were those of kitting up with battledress and tropical clothing, and the mustering and making good of personal tool kits. The men of MONAB II left for Liverpool docks on 18th –20th of November. Their palace was to filled almost straight way by the technical component of the first Transportable Aircraft Maintenance Yard, which like MONAB II its assembly was to be split, the HQ component to form at Ludham and the technical components at HMS GOSLING. The decision to divide these units caused many problems for both MONAB II and TAMY 1, mainly a lack of co-ordination between the two halves over the completion of tasks and administration. TAMY I left for Liverpool of February 16th. From December 1944 men were drafted to GOSLING for the formation of new technical units designed to be added to MONABs operating in forward areas. Two Maintenance, Storage & Reserve Mobile Repair (MR) 1, was formed in February 1945 . By the end of February 1945 the MNAO had relocated to the former R.A.F. Middle Wallop in Hampshire, a far more suitable base for forming the mobile units, and the need for splitting future MONABs was avoided. HMS GOSLING settled back into its normal duties of training and the production of Radio and Radar vehicles. A recently publish memoir ('Above & Beyond' 2014) has brought to light a previously unknown clandestine element of HMS GOSLING: It reveals that in addition to carrying out the duties of Gunnery Instructor teaching new entrants, by night Leading Seaman Laurence Biggs was teaching weapons and commando skills to civilians going behind emery lines, and when called for, he operated as the Coxswain of a vessel on covert operations with one of the RNs Special Operation Groups. On March 1st 1946 HMS GOSLING became a general service training establishment for basic (part 1) training of Stokers, the FAA training being transferred to other stations. R.N.T.E. Risley paid off and closed on October 21st 1947. E-Book: 'ABOVE & BEYOND' Laurence Walter Biggs' story tells of his journeys in World War Two. 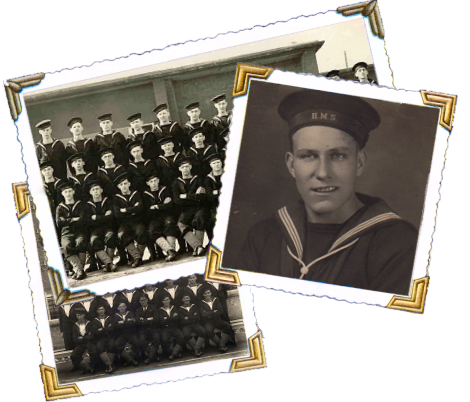 As a Leading Seaman Gunner he was a weapons instructor at HMS GOSLING and an operative in the RN special Operations Group conducting clandestine missions. Section 2 - Report of proceedings of H.M.S. Nabberley. (M.O.N.A.B.2, Bankstown). Section 8 - Report of proceedings of H.M.S. Nabsford (T.A.M.Y.1 - Brisbane). HMS Gosling 5 ceased to be known by that name after it was paid off in 1947 (on Trafalgar Day! ), but it remained in use by the Admiralty as accommodation for married employees working at Risley. Until a few years ago the concrete bases for the accommodation huts (NOT Nissen!) were still there, as were the pathways through, also the Country Club (as it was known). The buildings were meant to be temporary but as is so often the case, lasted quite some years longer than planned. I understand it is now being developed for housing. I lived there as a child in the late 1950s.